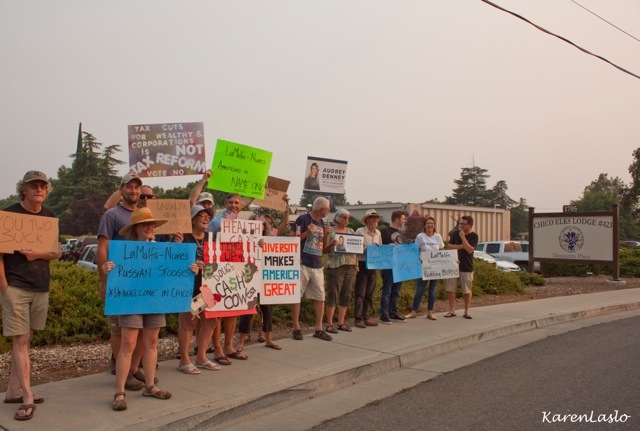 Chico’s Raeanne Flores-Owens protested with about 19 other people Monday, saying that while Rep. Doug LaMalfa (R-Richvale) was raising money for his re-election campaign, much of the Northern Sacramento Valley was burning. “We are covered in smoke, it’s hazy, our children can’t play outside,” she said of the Carr Fire’s impact. Wes Owens, Raeanne Flores-Owens and Micha Lehner were among those protesting the conservative District 1 congressman. The 110,000-acre Carr Fire has been identified as the most destructive fire in Shasta County’s history, and the weather system the fire is generating has been linked to climate change. Air quality in the northern valley today ranges from “unhealthy for sensitive groups” to “hazardous,” according to KRCR news. Flores-Owens was one of the protesters outside the Manzanita Place event hall in Chico who oppose the Republican congressman’s position on climate change and his support for President Trump’s immigration and tax policies. 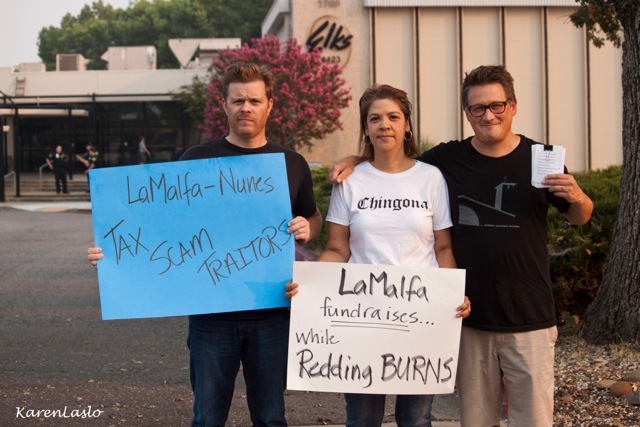 LaMalfa’s staff, meanwhile, held a dinner that cost donors up to $5,400 for those who wanted to be “event chairs.” Congressman Devin Nunes (R-Tulare) was advertised as a guest at the round-table discussion and dinner. “Climate change is happening and they are willfully ignoring that, and we, the 99 percent, are suffering because of it,” Flores-Owens said. Does anyone know how much money was raised last night? Appreciate individuals speaking up for their choices. Thank you. We do need a change; it’s been much too long without one. Rice farming takes an enormous amount of water. Draining the lands to satisfy, industrial, agricultural, urban and domestic use, has rendered California lands dry as bone. Vote this welfare recipient out of office. Vote for Audrey Denny.